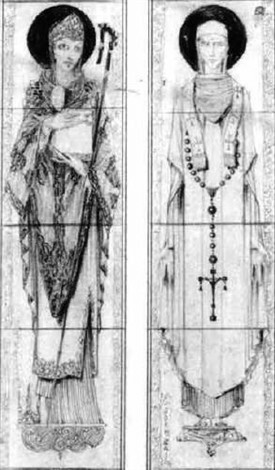 St. Mary's Church representatives has copies of the original designs, for the eight Irish Saint's panels by Harry Clarke drawn in 1925. They are beautiful precise drawings displaying the symbol of each saint at the top, the main panel with the saints name in a scrolled panel and the predella; representing a story from the life of each saint below. It is interesting to note the slight changes that occurred between the original design and the final stained-glass window in some cases e.g. there were three birds in St. Keiran's design that do not appear in the final panel. 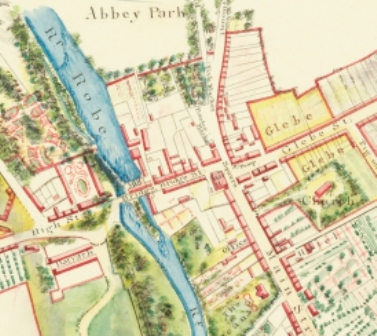 Harry Clarke visited St. Mary's in December 1925 to see the windows in their final location. This page was added by Averil Staunton on 14/08/2013.